Probably the most advanced automobile manufacturer in America during the post-WWII years was Crosley, a radio and refrigerator manufacturer. They pioneered the production of quality small cars for a nation raised on cheap fuel and high speed. The first Crosley car made its debut at the 1939 New York World’s Fair. In 1950, Crosley introduced disc brakes on their cars. 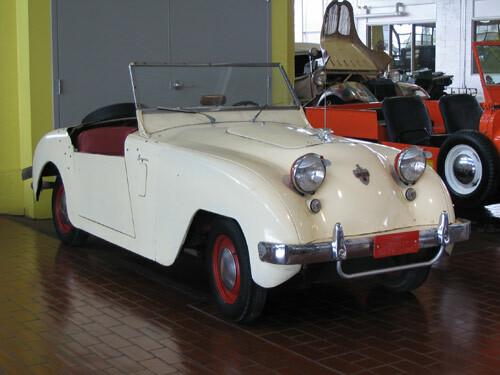 Crosley made many different body styles from the same chassis. In 1949, Crosley introduced the Hotshot, a tiny, doorless sports car that was highly successful in racing. A fancier version with doors is the super sports you see here. This car will achieve 0 - 60 mph in approximately 20 seconds– amazing for a car this size. Pound for pound, some say the Crosley super sports is one of the greatest sports cars ever built.